Chameleon Card: Simmons' Universal Credit Card? The new Chameleon Card (and associated Pocket Vault) provides a single card that gives access to all of your bank and credit card accounts. This kind of card is of course familiar to science fiction fans; the universal card of Dan Simmons' 1989 novel Hyperion has all the same features, and you can use it on hundreds of different planets (not just this one). The Chameleon Card has a black strip just like all of your credit and identification cards; but this strip covers a programmable transducer that will output the information of each of your cards. 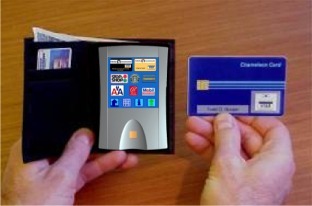 Unfortunately, it is not a stand-alone device; you also need the Pocket Vault (about half the size of an iPaq Pocket PC) to store the information on your real credit cards. Each time you want to use your Universal Card for a different credit card, you need to swipe it through the Pocket Vault to put the appropriate information in place. See Chameleon Card Changes Stripes, Chameleon Network (company homepage), and Chameleon's Karma for an earlier take on the Chameleon Card and Pocket Vault.